An awful lot of it leftover, there. So naturally, I thought six of the most dangerous words in the English language: You know what would be fun…? Father-son Lillehammers. Because nothing says, "Hi, I'm a kid who is going to need serious therapy someday!" like a little boy forced wear daddy-n-me matching sweaters in public. Awesome. Now, this one for Captain Adventure is going to be less complex a pattern than Daddy's. The main panel on the Lillehammer is ornate and wide…like this. 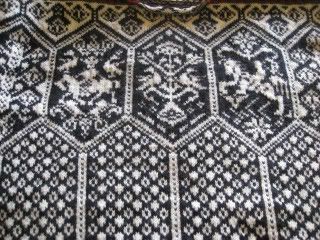 I'm also using a different base yarn for the black and white; I had enough white leftover, but not the black; but I did have some black and white Knit Picks Telemark I'd reclaimed from another project. 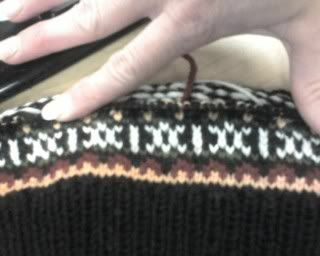 This is a slightly narrower yarn than the Merino Style I used in the other sweater, so I had to go up a needle size to get gauge…which was actually good, because now I can use my KnitPicks Options interchangeable, which means I have the giddy, immortal power of choosing what length cable I want to use, at my whim. Hey, with knitting, you can make it be exactly what you want. You can frog it and redo it as often as you need to until it is absolutely perfect. How often do you have THAT power? Laugh away, I say. Nice knitting! I love the idea of daddy and son sweaters. What's the point of having kids if you can't warp them somehow? :-) I used to dress all three of mine in matching shirts when we went out (zoo, mall, etc.). Now they're bigger than me so I can't do that anymore. Sad.